After Anna “Turtle-Arts” Earley participated with the Darknut from Zelda: Wind Waker in 2012 and the start of Link’s Blacklist, she wanted to be a part of the second round of our big art collaboration project as well and claimed the Poe from Zelda: Ocarina of Time since they are her favourite monsters of the whole Legend of Zelda series! The Poe’s are recurring enemies of the Zelda series which debuted in Zelda: ALTTP and returned and almost all later games. 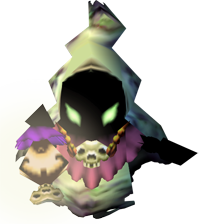 In The Legend of Zelda: ocarina of Time they look like hooded wraith with lanterns. Targeting the Poe will make it invisible for a short time, while the lantern will remind visible though which allows it Link at least to dodge the Poe’s attack and know where it is.